This month has held some important milestones for me and my family. I completed a year of teaching social studies to middle school students. What a challenging and interesting experience! I taught history and geography to 6th, 7th and 8th graders. Early teens are a tough time in life, but they are also the “wonder years”. One of the lessons I did with the seventh graders was having them write about a New Mexico historical event and share it with a family member, who in turn told them something about their life. It wasn’t easy to get them to complete the assignment, but they discovered some really great stories. My son also graduated from High School this month. I am so very proud of him. He’s a strong individual pursuing his own interests in life, but he is also considerate of others and a great young man. Some life experiences we don’t want to end. But life goes on and we can’t stay stuck in the past. We need to live each day fully and be “present” to the present. However, the benefits of preserving your personal history are many. Written and recorded experiences allow us to revisit our past. In that sense, this month of May never ends. I swear I found the key to the universe in the engine of an old parked car - Bruce Springsteen from "Growin' Up"
Leslie, my sister, found this picture of me when I was in Kansas City for my father's funeral in January. It is dated February of 1958. That would put my age at two years and a couple of months. I am holding my beloved "Ted Bear" that I dragged everywhere. 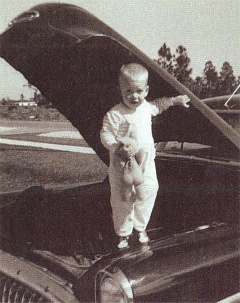 As you can see, I am standing under the hood of our family car, one of those huge old Buicks, a big, solid car. I have never been very good at working on cars. But I certainly admire those who have the knack. My brother, Doug, is one. So is a friend of mine. Paul is not only handy with a wrench and knowledgeable about cars – he actually likes tinkering with them. Imagine that – I always look at it as a chore! At any rate, it makes me feel less guilty when he offers to do some repairs that normally would be cost prohibitive at the auto shop. Sure, I pay for the parts and give him something for his time, but nothing like the fees I’d incur at the neighborhood mechanic. There are times and jobs when I go to them, too, mind you. But the bonus of getting together with a friend or family member to spend some time under the hood of your ride can create important memories. Even those you laugh at now, but caused a lot of grief at the time, like breaking a bolt or a belt. The metaphor of standing under the hood got me thinking. What is "under the hood", i.e. inside our heads? We all have things that "drive" us. Our personal "horse power" helps us accomplish goals and pursue dreams. As I gaze down the tunnel of time I can't help but wonder about this young Tom. Surely I am full of wonder, like any two year old boy. I have a two year old grandson and he is a joy...and a challenge. My wife watches him during the work day and tells me Jacob definitely knows what he wants. I love being around him when I can. He’s getting quite talkative and cracks me up when he snorts like a pig or points out something in the sky he spies with his keen, young eyes. I can’t remember times like that with my granddad, but I’m sure they happened. What do you want out of life? How have the years and experiences shaped you? Have you started writing any of it down? Get "under the hood" of your life experiences. A good personal historian can be like a trusted mechanic. We can analyze your life experiences with professional detachment while being empathetic and encouraging. We can point out where you might need a topic checkup, such as playing sports (“What happened when your friends picked teams? Did you get picked early or last?”). Or perhaps when reminiscing about your school days (“Did you always do your homework, or did you procrastinate until the very end?”). Personal Historians can help you fine tune your memories. Your life story matters. Go for a "drive" down the highways and byways of your life and let a personal historian be your navigator. Getting your story captured and preserved can be a long and often expensive process. One of the things I am always on the lookout for are service providers that can meet your needs with quality and affordability. Legacy Keepers is a company that operates a nationwide network of highly skilled personal historians, graphic designers, filmmakers, and audio text and video editors. Their services result in quality video, audio and written products. They have also just introduced a new line - the Legacy Wedding line of videos and book keepsakes. Click the banner to find out more about Legacy Keepers and get your FREE interview guide.